Today we have Minoti (aka Mints) of Vadani Kaval Gheta share her insight into regional cuisine and food cuture of the western ghats of Maharashtra. 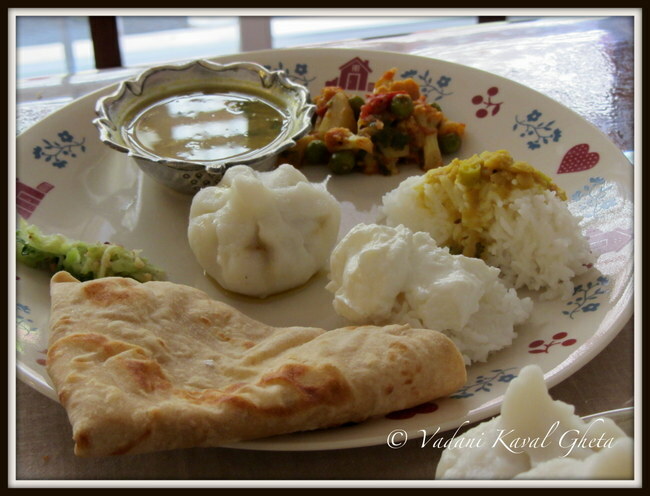 Vadani Kaval Gheta is run by Minoti, an Indian food blogger based in the US. Minoti has previously shared an indepth article on Khandeshi cuisine. Thank you, Minoti, for sharing with us your favorite regional food cuisine as part of the Indian food trail series! Growing up in a rural Western part of Maharashtra known as ˜Ghat gave me good insight into day-to-day food habits of people from various walks of life. There is huge variety in preparing western Maharashtrian food even with very common ingredients. Let’s see some examples here. You might have heard about Maharashtrian masala called Goda Masala but that is not very known beyond certain communities of Maharashtra. Some people use variations of Garam masala ground together with caramelized onion, dry coconut, garlic and red chili powder in proportion that varies by household. Generic name for this is MisaLaleli Chutney (mixed chutney) and widely popular as Kanda Lasun Masala (Onion-Garlic-Masala) but the store bought variety is not as flavorful as homemade. Most of the families make this in a batch that can last from few months to whole year. Beauty of this masala is that you do not have have to use additional garlic or coconut while making sabji in a jiffy. The coconut and onion thicken the gravies and gives unique taste to sabji. Usually in cities people eat more wheat roti called Chapati or Ghadichi Poli everyday but in small towns and villages people eat more ˜Bhakari or Jowar Roti, but that is not the rule either. This habit may have come from the fact that this region traditionally grows more Jowar/Sorghum than wheat. Ragi(Finger Millet) Roti, Bajara Roti are also made in some parts. Agriculture is main industry and sugarcane is main crop of the region. If you ever drive through this region on NH4, you can see lush green sugarcane fields everywhere. Almost every town has one big Sugar factory and various Gur/Jaggery making small scale industries. Molasses-like syrup called Kakvi is a by-product of Jaggery making process. As kids we used to enjoy this syrup with chapati. Even with that much production of sugar and jaggery, I have not noticed farmers or people from villages using pinch of sugar/jaggery in their daily sabjis. Sugar and jaggery makes me think about major sweets prepared during festivals. Most of the household in villages make Puran Poli for festivals like Gudhi Padawa/New Year, Dasara, Laxmi Puja during Diwali, and Holi. Boondi Laddoo or Jilebi is must have for weddings. Indian Independence Day (15th August) and Indian Republic Day (26th January) are celebrated with Jilebi. If you happen to pass through vicinity of Kolhapur and Satara on these two days, you can see most of sweet shops selling this orange delicacy by kilos. Some parts of Kolhapur and Solapur districts of Western Maharashtra grow different varieties of chilies including very spicy chili called Lavangi mirchi (Clove Chili), medium spicy chili called Sankeshwari Mirchi (Chili from town of Sankeshwar and mild and bright red chili called Byadagi Mirachi. Food from Western Ghats of Maharashtra tends to be more spicier than Pune and Mumbai. Mirachicha Thecha is a savored side dish. Peanut is a seasonal crop and is staple in most of the household in the form of oil and roasted powder. Most of the sabjis and koshimbirs (salads) gets generous helping of this roasted peanut powder making sabji really delicious. Peanut chutney is a must have. Raw onions, fresh green chilies are still served as sides in rural areas. Dried peanuts in their shells are served during meal and everyone shells these one-by-one as needed. Boiled peanuts with salt is my most favorite. We sometimes boil more and sun dry some and eat throughout the year. Almost all the small farmers grow vegetable patch for regular disposable income. Leafy vegetables like methi, ambat chuka(green sorrel), ambadi(red sorrel or gongura), cilantro, other vegetables like eggplants, ridge gourd, okra, tomatoes are also grown. These small farmers then take the produce to the local farmers markets on weekly basis. We stayed in the midst of farmland of the town and were very lucky to get farm fresh produce almost daily if needed. Everyday Breakfast Thali: Back in the days leftover Jowar Roti with yogurt and dry peanut Chutney was main breakfast thali. Kids enjoy leftover Chapati with milk/tea. 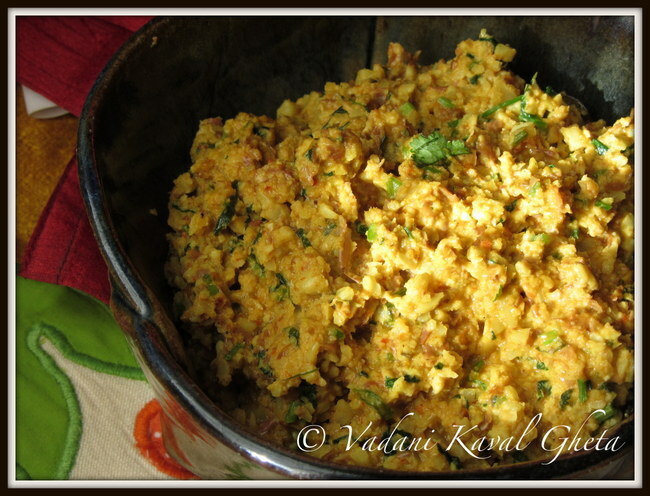 Kande Pohe, Upama/Uppit, Dadape Pohe and Sanja are made occasionally mainly for guests. Few more things make quick appearance in breakfast thali are phodaNicha Bhat, phoDaNichi Poli or phoDaNichi Bhakari(made almost same way as phoDaNichi Poli). Makyache uppit is also another favorite breakfast during the corn season. Everyday Lunch Thali: One dry sabji, one daal/curry sabji in bowl, Jowar Roti or wheat Chapati, white rice called bhat made on daily basis. Pickles and chutneys like mirachicha thecha, coconut-garlic chutney, dry peanut chutney, mango pickle or green chili pickle adorn the left side of the plate. Sometimes peanuts in their shells are served in individual plates and everyone shells their own while having their food. Small onions are also served and everyone smashes their own with fist and enjoy with lunch. Seasonal raw vegetables like carrots, cucumbers, tomatoes are served as sides when available. Variety of dry vegetables change by season. 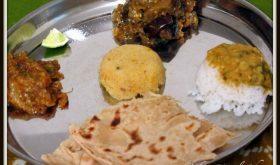 GhevaDyachi bhaji, Moog/ChavaLichya shengachi Bhaji, Batatyachya kachaRya, Karlyachi Bhaji, Green Beans chi Bhaji, Daal Kanda, Dry Cabbage Sabji, vangyache bharit are some examples of sabjis made in the region. Spicy delicacy called Paatvadya, or zunaka patties are made for special occasions. Variety of leafy vegetables adorn the plates in sabjis like Dry Daal Methi bhaji, Zunaka, Dill Bhaji, Ambat chukyachi(green sorrel) bhaji, ambadichi (gongura) bhaji, Chakavatachi Bhaji and Palak(spinach) Bhaji, and many more dry vegetables are eaten on regular basis. Bhajis with Curry/Gravy have huge variety including, but not limited to, Kanda Batata Rassa, Vanga BaTatyacha Rassa, Dal Vange, Flower-Batata Rassa, Ridge Gourd Sabji, Stuffed eggplants with rassa, Methichi patal bhaji. Variety of dry chutneys served are staple peanut chutney, garlic chutney, khurasaNi (Nyjer or Thistle seeds) chutney, Sesame chutney and flaxseed chutney. Variety of Daals, lentils and beans like Mataki/Moth beans, Black Eyed Peas, Moog, Masoor/Lentils, dried peas, black chana are used sprouted or un-sprouted in Usal. Even though most usals are made using same recipe, the final results come out very different due to tastes of beans. Amati is maharashtrian name for cooked daal. There are lots of varieties of amatis made from toor daal. Here are some of my favorites – my Grandma’s Amati, Chinch Gulachi Amati, Shevagyachya (drumsticks) Shenganchi Amati, Tomato Amati. Split moong daal, masoor daal, also used to make various amatis. Panchmel amati meaning amati made with 5 mixed daals, toor, moong, chana, urad and masoor. Sprouted legumes regularly made into tasty amatis like Chawalichi (Black Eyed Peas) Amati, Moogachi Amati, Masoor (Lentil) Amati. Fresh Lima beans, fresh black eyed peas also made into amati when available in the season. Sometimes it is very difficult to find vegetables then Chana besan comes in very handy. Besan poli or besan crepe is make instantly to eat with chapati or bhakari. 1. Fresh Jowar Roti is served with leftover sabjis from morning, if any. 2. Fresh Jowar Roti with freshly made leafy green vegetables like Amaranth/ Chinese spinach. 3. Sometimes pithale and bhat are made fresh just enough for the evening. 4. Kadhi-Khichadi made once in awhile. 5. VaranPhale is another dish that is made occasionally in some homes and regularly in others. 6. Thalipeeth is made very often either with flour of roasted grains or by mixing various flours together and then adding onion-garlic etc. 1. General Festival Thali: Puran Poli and Katachi Amati are main attractions. Puran poli is either eaten with warm milk with dollop of ghee or with Gulawani. Gulawani is light jaggery syrup with milk. It is not very common in cities, but its usually made in villages. 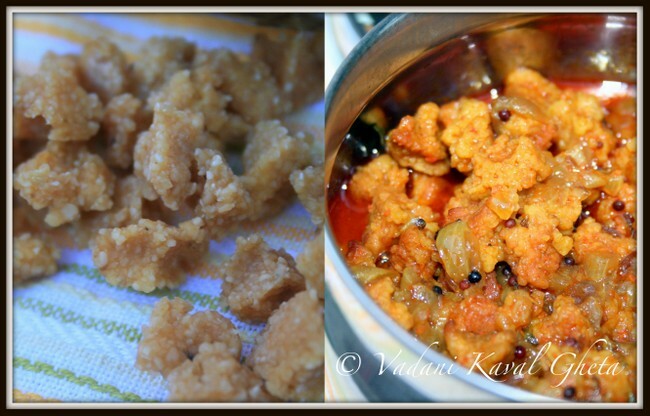 Deep fried papad, kurdai are must for festivals along with some kind of Pakodas. For GaNapati festival, special Modal thali is prepared. 2. Wedding Thali: Invitation goes out to whole village so simple food is served in large quantities. Masale Bhat, vangyachi bhaji, mattha. Sweet dish is either Bundi Ladoo or Jilebi. If enough yogurt is not available to make mattha, spicy dal is made. Its called Shak. 3. Thalipeeth Thali: Thalipeeth is made either by roasting all the grains and grinding into flour together or mix all the flours together, knead and make thalipeeth. Yogurt, home churned butter, variety of pickles are must along with any thalipeeth. Dhapate is another cousin of thalipeeth. There are various dhapate recipes, some include adding vegetables like large cucumber very similar to lemon cucumber. Some use cooked pumpkin or leftover eggplant sabji. Some make their dhapate by rolling like chapati, some make it like thalipeeth. 4. 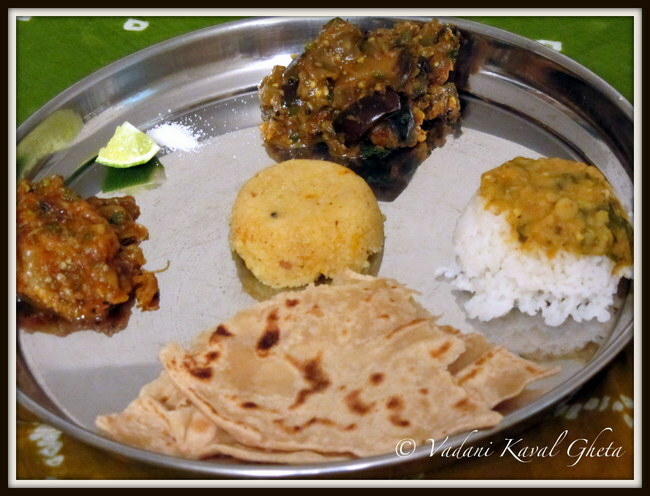 Upavasachi Thali (Religious Fast Thali): Usual Sabudana Khichadi is made often when fast is only half day. ShengdaNyachi Amati (Peanut Amati) with Varichya tandaLacha Bhat (Samo rice). 5. Pravasacha Dabba (Lunch box while travelling): People would carry their lunches and/or dinners with them when travelling. They would carry few chapatis, dry sabji made with lots of oil and without onion-garlic, dry peanut chutney, water in a utensil called phirachicha tambya, yogurt in a small container. Soak the groundnuts for at least an hour. Drain and pound to rough consistency. I would suggest using mortar pestle or just one whirl in food processor. But please do not use mixer/grinder. Consistency should be very coarse with few peanuts are just roughly bruised and some are coarsely powdered. Heat oil in a heavy bottom kadhai. Add mustard – cumin seeds and let them splutter. Add chili paste roast for few seconds. Now add the coarsely ground peanuts. Add salt and start stirring constantly. Sprinkle little bit of water if needed. Peanuts will start cooking and will turn translucent. Sprinkle chopped cilantro and enjoy with yogurt, chapati or bhakari. You can make drier version by using very little water while grinding. Before I give you actual recipe, I should give you little background about the main ingredient. Ladies of the house spent early morning of summer preparing various kinds papads, sandage, kuradaya (it looks like dry noodles and is deep fried) and stuffed green chilies, all sun-dried goodies. These goodies take a lot of manpower to make and are made during really hot days of summer. These are used during rainy days when fresh vegetables are scarce. Subject of summer specialities can make a whole new post in itself so I am going to Sandage (just like moong vadi) made with mixed daals or any one daal. It is soaked overnight and coarsely ground without (or very little) water. Then chili-garlic-ginger-salt paste is mixed in the ground daal. Small Â¼â€ morsels are made on the plastic paper from the daal batter. These are dried in sun for 3-4 days until completely dry. Then stored in airtight container to be used over the year. 4. Modak – Wheat flour cover and jaggery-coconut filling. These are either steamed or deep fried. Diwali is celebrated full four days in Maharashtra. One interesting tradition I saw was sharing diwalichya faralache taat (Diwali sweets and other morsels in a thali) with your neighbors and relatives. Everything made for diwali is put in a steel thali covered with nice crocheted doily. This thali is then carefully hand delivered to the neighbors. In return, the neighbours will send whatever they have made. Someone makes a special trip to the nearby towns to deliver faral boxes to close relatives. This is the region I grew up in and is very close to my heart. It is very difficult to convey every tradition in one article, I have tried my best to cover most important traditions. I hope you enjoyed the journey through Western Maharashtra Ghats as much as I enjoyed writing. Thank you Sailaja for giving me opportunity to write about my favorite regional cuisine – Maharashtrian food from the western ghats of Maharashtra. Chop onion in fine dice. Coarsely grind coconut and garlic together. Heat 1 tsp oil in a pan. Saute the sandage until golden brown. Set them aside. Heat remaining oil in pan, add cumin and mustard seeds. Add hing and turmeric when the mustard seeds start spluttering. Add chopped onion and saute until golden brown. Add back sandage and saute for 2-3 minutes. Now add hot water and coconut and garlic paste. Let it boil for just couple of minutes. The sandage should not disintegrate in water. Garnish with chopped cilantro and enjoy with fresh bhakri or chapati. By Sailu Published: September 25, 2013 Today we visit the western ghats of Maharastra on the Indian food trail. 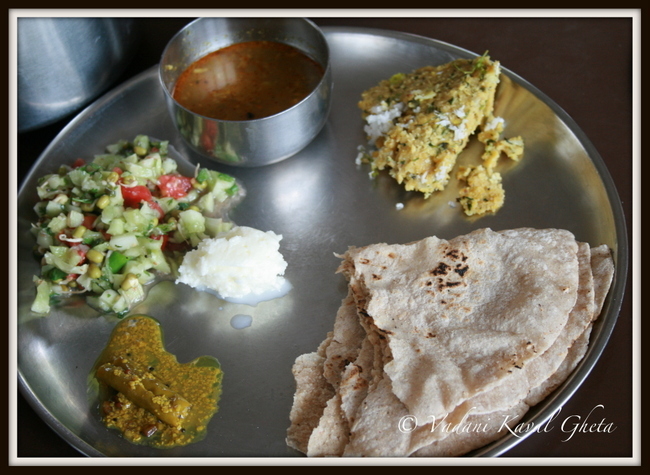 Maharastrian food and recipes from the districts of Sholapur, Kolhapur and Satara. very diferent recipes..i want to know abt dried sandage? hw to prepare that? Sandage usually prepared by soaking daals. My mom soaks almost all the daals together for about 7-8 hours. Then soaked daals are coarsely ground together with salt, ginger, green chilies and using very little water. Then small morsels are spread on polythene paper and dried in the Sun for 3-4 days until they are completely dry. Dried sandage can be stored in airtight container up to one year. ohhh it was same like varipindi vadiyalu in telugu.. right. .ok i got it thanq so much..
Another wonderful article from Mints! Thanks Sailu for hosting this series.